Once every few months, thousands of homeowners more their lawns to keep them short and eye-catching. To ease the process, people resort to different remedies. Slashers, for instance, are popular. Even though effective on small lawns, blisters and injuries are common on large lawns. Professional landscapers also do a good job. However, considering the eye-watering sum that they charge for their service, many people cannot afford them in the long term. Do not subject yourself to such stress. We have a better solution for you – electric lawn mowers. Over the years lawn mowers have improved in both form and function. Instead of the loud gas powered models, many people lean towards the quieter electrical models. They also have powerful cutting technologies that handle the toughest of cutting jobs well. 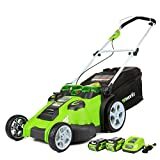 To get a durable model that you will enjoy using for years, the 10 electric lawn mowers that we have listed herein are the best. They are light, affordable, and recommended for day-to-day use. The GreenWorks line of lawn mowers has helped millions of people to maintain clean and well-manicured lawns for years. To get a similar experience without noise or high running costs, this 2501302 G-MAX model is ideal. Battery-powered (40-volts), it is quiet yet powerful. With every full charge, you will mow a large area without irritating your neighbors or sacrificing quality. The brushless motor that it uses is durable, while its spacious deck trims a large 19-inch area with each pass. This saves you valuable time whenever you are maintaining a large lawn. This machine also has a customizable height (1-1/4-3-1/2-inches) for adjusting grass tallness (seven-position) and a 3-in-1 steel deck. It can bag clippings, for instance. If needed, it can also bag or discharge grass clippings from the side to ease their management. Even though factory refurbished, Sun Joe MJ401E-RM is reputable among the best electric lawn mowers in stores. With one, you get a 12-amp electric mower with a modest 14-inch cutting deck. 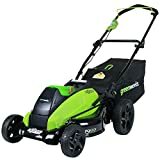 Even though smaller than GreenWorks 2501302 G-MAX, its lighter and streamlined design works better. You can move it around easily. It also uses less power and has a maintenance-free design that does not require tune-ups or oil changes to work well. With its adjustable (3-position) deck, you can tailor the height of your lawn effortlessly. You also get a detachable grass catcher for easy disposal of clippings and a 90-day warranty. Do you have a large lawn that you manage often? Are you tired of the low-powered lawn mower in your possession? 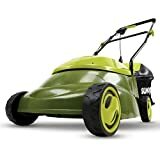 To handle the process professionally, buy this GreenWorks Pro GLM801600 electric lawn mower. Cordless, it is easy to maneuver. 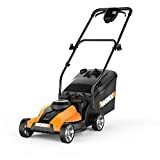 The 80-volt battery it uses has an impressive run-time, while its spacious 21-inch cutting deck handles heavy duty cutting jobs well. For up to 60-minutes you will cut grass effortlessly and either mulch, side discharge, or bag clippings for easier management. This mower has a quiet DigiPro motor that your neighbors will like and a smart cut technology that boosts its run-time. Electric lawn mowers have replaced slashers and loud gas-powered mowers popular in homes. Earthwise 50214, for instance, is a popular brand with many desirable attributes. Featuring a low profile 14-inch design, for instance, both men and women can use it effortlessly. Its corded electrical system works for long, while its adjustable height system works well. Depending on your needs, you can set it to cut 1.5-4-inch tall grass with the touch of a lever. For those that mow lawns for several hours every week, Earthwise 50214 has a comfortable V-handle. Wheels (6.5-inch rear and 5.5-inch front) roll smoothly on all terrain. Finally, if storage space is an issue, you can fold and store this lawn mower in a small space. Known for its dependency and quality, Black and Decker is one of the most trusted brands in most industries. People who enjoy using electric lawn mowers, for instance, choose BLACK+DECKER CM2040 to its competition. Even though its brand plays a major role, its performance has attracted its global fame. With one, you get a 40-volt electric lawn mower with a cordless 3-in-1 design. It has a good range. Its cutting path is large (20-inches), while its adjustable height (1-1/2-4-inches) works smoothly. 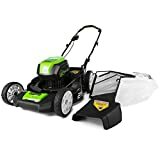 Whether you like short or slight tall grass on your lawn, you will achieve both easily with the help of this lawn mower. The nylon grass catcher it comes with is durable and accommodates up to 15 gallons of clippings. In the lawn mowers niche, the larger and powerful your product of choice the better. You are able to cover a larger area and handle the toughest of mowing jobs easily this way. EGO Power+ offers these benefits and much more. 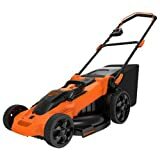 Buy yours to get a battery-powered (4Ah Arc Li-ion) 56-volt lawn mower with a large 20-inch cutting path. Cordless, you do not have to worry about cables limiting your range. The water resistant materials used to make it last long, while its foldable design stores upright in tight spaces. If you have a small shed or garage, thus, you will like this product. Lil’Mo from work is a portable 14-inch lawn mower. If you are a contractor who shuttles between work sites every day, it is a suitable lawn mower to own. It is also one of the best models for homeowners with small lawns because of its ease of use. Battery capacity is around 24 volts. Its quieter and cleaner system is ideal for day-to-day use. Finally, you get an Easy-Start feature, a three-year warranty, and detachable bag for storing clippings. This lawn mower also mulches and discharges clippings if needed. Even though BLACK+DECKER MTE912 lacks an extension power cord, it remains sought-after because of its value. Low-powered (6.5-amperes), for instance, you will like its lower running costs. You will also appreciate its performance. Its 12-inch deck mows and edges well. It also has an automated feed system (AFS) that improves its efficiency and a smooth gear drive transmission system that never disappoints. Forget about your old electric lawn mower that bumps or bogs you down often. With this model, you will mow or edge lawns like a professional without using a lot of energy. 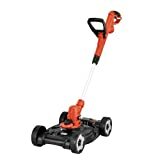 Do not confuse Sun Joe MJ401E Mow Joe’s compact design for a weakness. Even though it only has a 14-inch cutting deck, its durability and performance outdoors are impressive. Because it is lighter than some larger models, for instance, you do not have to struggle with it to keep your lawn tidy. Once you have charged it to capacity, you can operate it easily over your lawn and have quality results as a result. Power output (12-amperes) is desirable. Finally, with an original mower, you get an ETL-approved product with a 2-year warranty. It also has a detachable grass catcher and an adjustable 3-position cutting deck. In our review of the best electric lawn mowers, GreenWorks 25302 G-MAX fills the top spot. 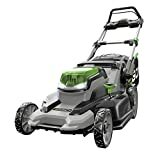 Featuring a 20-inch twin-force deck, its high capacity design is suitable for heavy-duty mowing. It also has a convenient cordless design with two batteries (4Ah and 2Ah) that keep it working longer. The advanced switch-over technology that it uses draws power from the second battery automatically when the first one runs out. Other novel attributes are its power efficient Smart Cut technology, superior mulching/bagging, and its ever-sharp dual blades.